The European livestock sector is expected to benefit from world population and income growth, contributing to higher EU exports. However, growth will not benefit every sector of the market. While consumption of cheese and processed dairy products is expected to rise, for example, demand for fresh milk is expected to decline. These are among the predictions presented by the EU agricultural markets outlook report for 2017-30, published on 18 December 2017. By 2030, world milk production is expected to reach more than 1 billion tonnes, with the EU expected to supply close to 30% of the global increase in import demand. 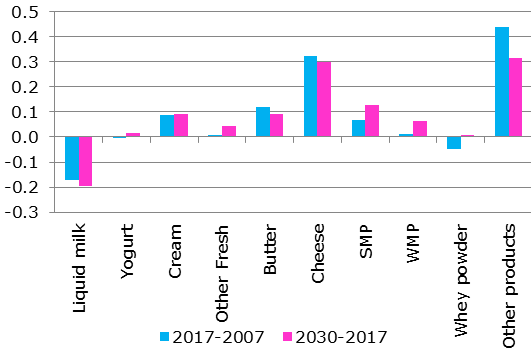 The quantity of EU fresh dairy products in net trade (the difference between exports and imports) is projected to reach just over 1.08mt in 2030, compared to 1.05mt in 2017. In parallel, European consumption is likely to need close to 900,000 t of milk per year to satisfy the growth in domestic use. This will go mainly towards cheese and the processing of other dairy products. Liquid milk consumption is projected to continue its decline due to changes in lifestyle and promotions of lower dairy product intake for adults. However an increase in processed products will be linked to a higher use of cheese, skimmed milk powder and butter for pizza and other prepared meals. The sustained European and global demand is projected to support prices and lead to an increase in EU milk production of below 1% per year on average, according to the report. This corresponds to the potential rise in demand, taking into account that the EU is competing with New Zealand and the US. The report also predicts that the development of EU production will be limited due to the need for sustainable use of natural resources, although a significant rise in organic production is predicted in response to consumer demand. 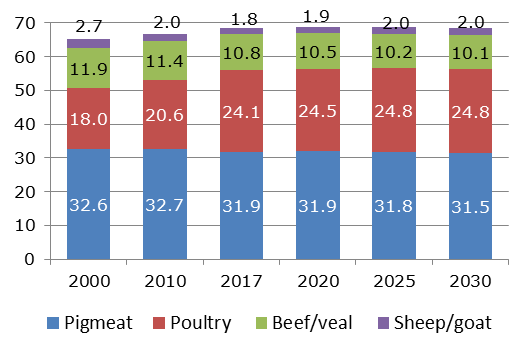 As with the milk and dairy market, the EU meat market will be supported by higher global demand over the period to 2030. 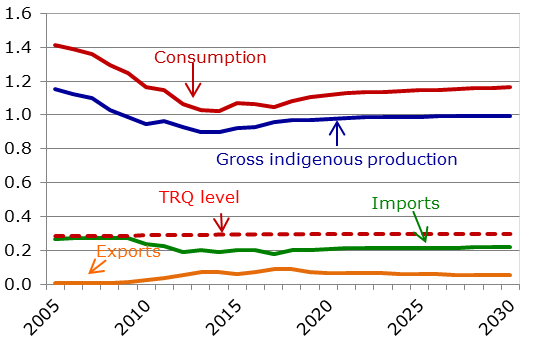 This in turn should lead to higher exports, from 4.35mt in 2017 to 4.7mt in 2030. This increase mirrors world meat consumption, which is expected to grow by 1% per year or by 14% between 2017 and 2030. 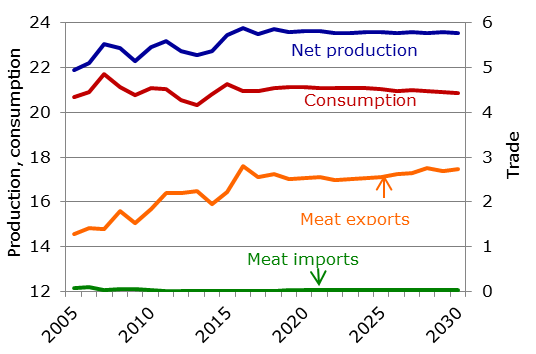 Despite the predicted global rise in consumption, European meat consumption is stabilising at best, with per capita consumption of 68.5kt in 2017 and 68.4kt in 2030. Consumption of fresh meat is particularly expected to decrease, although this is likely to be offset by the increased use of meat products as ingredients in processed food. The report predicts that 90% of total EU meat production will still go to EU consumers by 2030, when total production should rise to around 47.5mt, of which 44.1mt will go to the European market. Production of beef is expected to stabilise in 2017, but return to a downward trend for the rest of the period, falling to 7.5mt in 2030, compared to 8.1mt in 2017. Lower domestic demand along with a decline of the cow herd will be the main factors for this drop. As for the sheep and goat market, after several years of continuous decline, production and consumption are expected to slightly increase over the period to 2030. Production will reach 997,000 tonnes in 2030, compared to 957,000t in 2017. 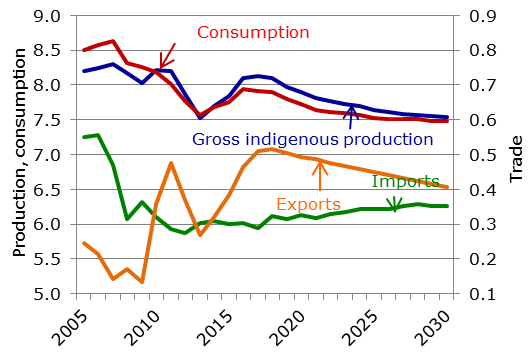 European consumption will increase to 1.16mt in 2030 from just under 1.1mt in 2017. This increase is due to improved profitability and the use of voluntary coupled support for farmers in some EU countries. As far as the pigmeat market is concerned, production is expected to only slightly increase by 2030 despite favourable feed prices. The production will reach 23.6mt in 2030, compared to 23.5mt in 2017. This decline is due to no real change in European consumption (20.95mt in 2017 and 20.87mt in 2030), but also to competition on the world market. Within the EU meat sector, poultry meat is expected to see the biggest increase in production, an increase of 5% between 2017 and 2030, from 14.7mt to 15.35mt. The increase will be driven by world import demand as well as domestic consumption. However prices will be under pressure due to increased competition on the global market. The EU market price is projected to decrease from €1,804/t to €1,728/t in 2030. 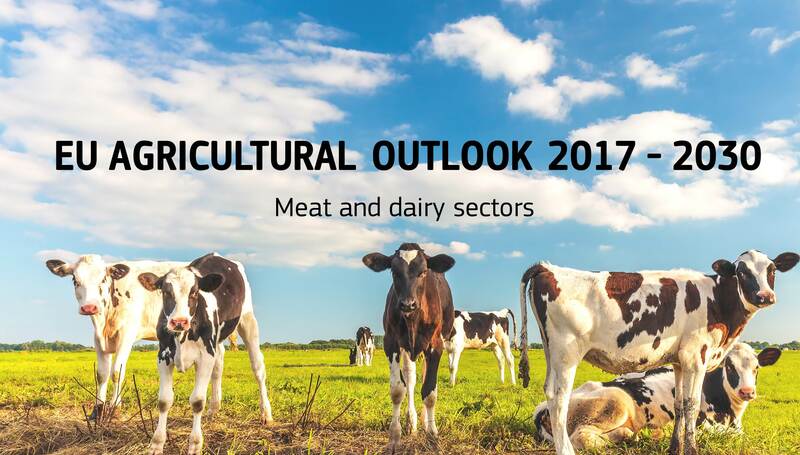 More detailed information and data is presented in the 2017-30 EU agricultural outlook report, along with predictions for other EU agricultural markets, and is also discussed during the EU agricultural outlook conference in Brussels on 19 December. Mixed outlook for wine, olive oil and fruits and vegetables: consuming less, exporting more. EU report predicts the European agricultural workforce will shrink by 3.2% on average per year, reaching 6.6 million by 2030. The EU agricultural markets outlook report for 2017-2030 looks at the expected development of certain environmental indicators. Published on 18 December 2017, the EU agricultural outlook report presents predictions for the EU agricultural markets and income for 2017-30.